Escaped Brit Beaver: Gnawing Dilemma; Sexual Allure May Get IT! 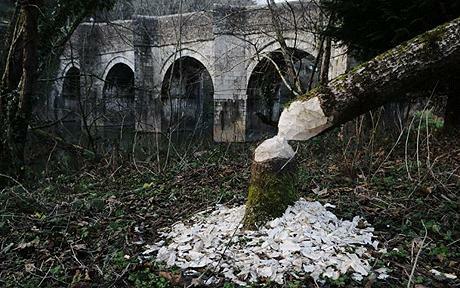 The beaver weighs 40kg – about six stones, and was brought to the UK five years ago from Bavaria, in Germany. He lives on a vegetarian diet of reeds, bark and leaves and seldom strays less than 50 metres from water. It is described as docile and “family-orientated” despite being able to fell trees with its sharp teeth. Beavers were hunted to extinction in England hundreds of years ago but this creature has gone on the run from a farm in the west country. Conservationist Derek Gow, the owner of the unnamed beaver, said: “It is one of those things that happen. “It’s not anything that anyone intended to happen. It’s not something anyone wanted to happen, but it has happened,” he said. Mr Gow is a keen advocate of reintroducing beavers into the English countryside after they were hunted to extinction for their fur in the 13th century. “We’ve got traps being made up at the moment. The furry escapee and his trail of destruction were widely covered in Wednesday’s national newspapers. Gow suspects the electric fence surrounding his beaver pen failed during a flood.